We have used plasma drift and magnetic field measurements during the 2001–2009 December solstices to study, for the first time, the longitudinal dependence of equatorial ionospheric electrodynamic perturbations during sudden stratospheric warmings. Jicamarca radar measurements during these events show large dayside downward drift (westward electric field) perturbations followed by large morning upward and afternoon downward drifts that systematically shift to later local times. Ground-based magnetometer measurements in the American, Indian, and Pacific equatorial regions show strongly enhanced electrojet currents in the morning sector and large reversed currents (i.e., counterelectrojets) in the afternoon sector with onsets near new and full moons during northern winter warming periods. CHAMP satellite and ground-based magnetic field observations indicate that the onset of these equatorial afternoon counterelectrojets is longitude dependent. Our results indicate that these large electrodynamic perturbations during stratospheric warming periods are due to strongly enhanced semidiurnal lunar wave effects. The results of our study can be used for forecasting the occurrence and evolution of these electrodynamic perturbations during arctic winter warmings. 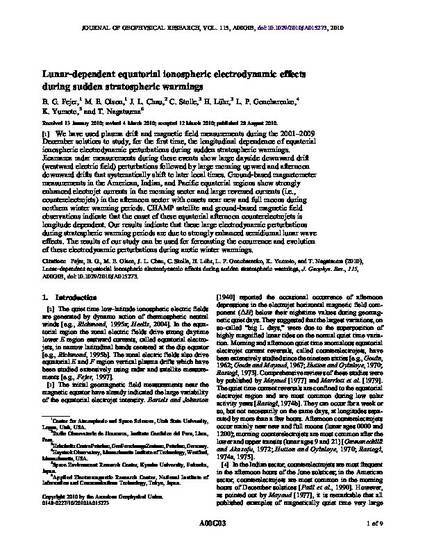 Fejer, B. G., M. E. Olson, J. L. Chau, C. Stolle, H. Luhr, L. P. Goncharenko, K. Yumoto, and T. Nagatsuma, Lunar dependent equatorial ionospheric effects during sudden stratospheric warmings, J. Geophys. Res., 116, doi:10.1029/2010JA015273, A00G03, 2010.